Internet Retailer's latest survey shows that 65% of shoppers abandon a site if they can't find a product quickly and easily, a statistic that should shock nobody. So how do you know if your site is a victim of this? How do you measure your site's searchability? Here's the basic scenario of a shopper that can't find what she's looking for: a shopper enters your site, tries a search, clicks around, and leaves before getting to any specific product's detail page. So what you're looking for in your analytics tool is any visitor that visits at least 2 pages and never hits a product detail page. There are certainly other scenarios that illustrate this kind of frustration, but let's stick with this as the most obvious. In Google Analytics one easy way to find these people is to use advanced segments. Set up a custom segment that includes the poorly-named Page Depth constraintm(Page Depth is really the number of pages in the visit) of great Greater than 1. This gets you to those that have clicked around just a little bit. Now you have to exclude those that visited a product detail page during their visit. 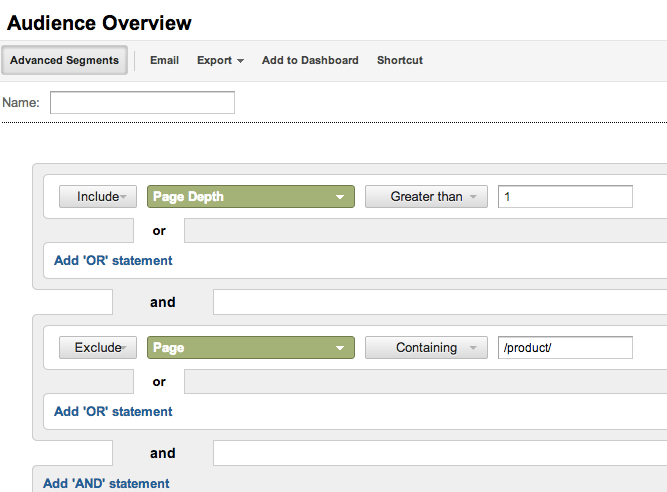 In your new custom segment add an And constraint and choose Exclude and Page. Now, the value for this is going to depend on your site's navigation and URL structure, but let's say that all of your products are on URLs like http://www.mystore.com/products/product-name, so that http://www.mystore.com/products/summer-loafers would be the URL for a specific product. If that's the case, maybe you can use Contains /product/. The result is the segment you see below. Once created you can select it to see what portion of your customers are abandoning your site without finding what they're looking for. Unfortunately, there is no industry-wide threshold for good or bad that I know of, but if, for example, half of your shoppers are abandoning your site before getting to a product detail page that's probably a bad sign that your site's search and navigation is too hard to use or not good enough.